You probably have heard about a pintle hitch but you don’t really know what it is all about. A pintle refers to a type of bolt or pin that is generally inserted into a gudgeon. A gudgeon itself is a part of a hinge or a pivot. The pintle, along with a lunette ring, is generally used for towing. Pintle pins would secure casters within a furniture. The sets of pintle are in used in many applications. For instance, if it is used in sailing, it will secure the rudder onto a boat. In transportation, the pintle will clamp through a special lunette ring on a trailer. In the electrical cubicle, the pintle hinge is basically a hinge for moving parts. 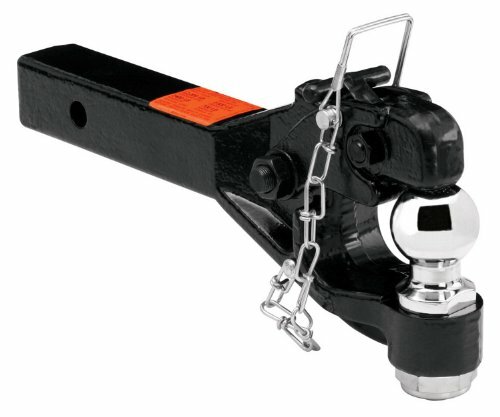 For this matter, we are going to discuss a pintle hitch that is a part of a towing hitch using a special configuration for the tow ring to attach a ball or a hook. The purpose is so that any unpowered vehicle can be towed easily. In general, a pintle hook or hitch would look like a hook attached (and closed) around a lunette ring. The ring has been mounted on a trailer. A different pintle combination can be used for different purposes, towing needs, and also condition. In some cases, you will need a rough and sturdy construction for rough terrain. Keep in mind that there are limitless types of pintle type out there. But we are going to narrow it down to several options only. They are chosen because they are considered the best in this industry, in terms of performance, quality, construction, and use. When we are talking about a pintle hook, this product from CURT is always included in the list. It’s because the product is known for its good construction and quality. If you check the review section, you will see that they have tons of positive reviews and very limited negative feedbacks. In most cases, the negative feedbacks are more about the disappointment from the users because they find the pintle to be different from their expectations – it is heavier than they think or it is more solid than they have expected. In general, the pintle is flexible. It fits perfectly with hitches with receiver tube opening of 2 x 2 inches in dimension. Don’t forget that you should pair it up with the right lunette ring – and its size. The perfect fit would be with a lunette eye having 2.5 inches on the inside diameter. 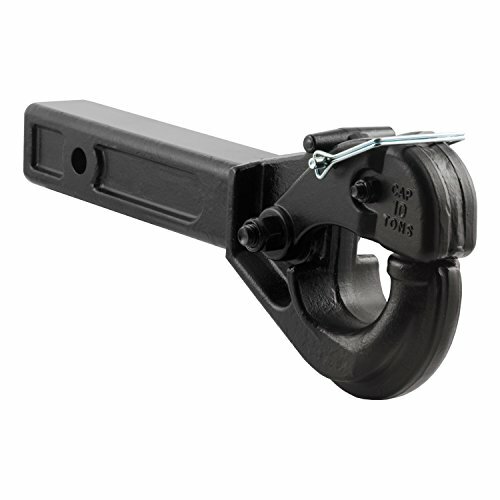 The locking arm has a spring load that would protect the coupling action. not to mention that it is coming with a powder coating finish that makes the overall construction solid, durable, and strong. The pintle itself is made from forged steel that has been strengthened for an added solidity so you can expect superior quality and also strength. The pintle itself is pretty affordable. It is definitely an affordable price when compared to the strength. This kind of pintle has been used in heavy-duty towing job – heavy trailer or heavy RV – so you can imagine the solid construction and the tough strength. A lot of users claim that the pintle doesn’t need any adjustment or change. It comes with the right size that snaps easily once attached. Some users also use this pintle to tow other heavy machinery such as a tractor. The result is pretty impressive and amazing – you won’t regret purchasing it. This is another powerful pintle hitch with quality construction and performance. As you can see, such a pintle construction needs to be solid and strong because it is often used to tow heavy machinery and other buff vehicles. When compared to the previous product from CURT, this one has a higher price tag. But then again, if you like construction and quality over a slightly higher price range, then this device would be the perfect option. If you take a look at the design, it may seem complicated and complex, but the method of operation is pretty simple. The balls have this nice switch mechanism that can be activated by turning the shaft. Yes, it is as simple as that. It comes with tri-ball hitch construction that will handle different ranges of setups and sizes of the towing ball. You can say that the overall design and construction are pretty clever – not to mention also effective and convenient because everything will run and operate as expected. The attachment and locking mechanism are pretty simple. The upper jaw can match the lunette eye nicely without any changes or adjustment. When the upper jaw matches perfectly with the lunette eye towing, it would close in just nicely and easily. The easy mechanism and operation don’t match the solid and tough construction. The ball, for instance, with its 1-7/8 inch dimension can take up 6,000 lbs. The 2 inches of the ball can accommodate 7,500 lbs. The 2-5/6 inch dimension can accommodate 10,000 lbs. Can you imagine the ability? 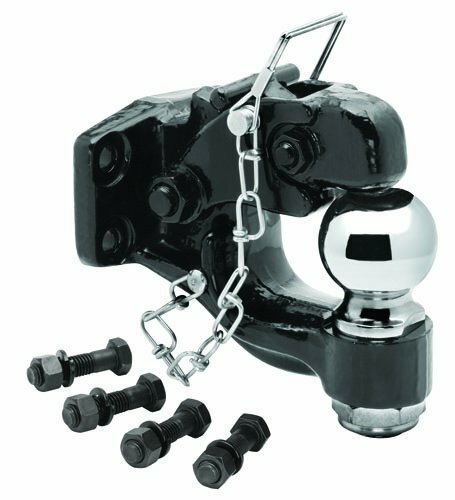 Not to mention that the towing balls are made from welded steel and chrome and then coated with black powder finish that is resistant to corrosion. All of these constructions and make would improve the overall strength of the pintle without compromising its ability to move around and be flexible. When compared to the previous two products, this one has a higher price level – again – but it is for a good reason. Whereas the two previous products require two different products being attached together, this one doesn’t require such a thing. This is one pintle hitch product that comes in one solid construction so it would make everything easier. If you take a look at the overall construction, you will see a tough and sturdy product. Everything is rock solid, not flimsy or weak as other cheaper products. After all, this product from Reese Towpower is used to tow heavy vehicles and buff machines so you need to make sure that you are using the right item. You can be sure that the pintle will secure your towing activity in the safest manner. After all, this pintle is coming in one solid construction that will make the overall operation easier. The pintle has different hardware kit grade, up to 8. With a black finish, the pintle looks somewhat elegant and classic. What about the construction? Be sure that it is tough and sturdy. What about the other features? It comes with a nice finish that will protect the overall device, including the resistance ability to corrosion. Most users claim that the one construction design makes everything easier and somewhat more efficient. Instead of having two different parts that have to be bolted together, this one is definitely handier. You only need to snap it together and voila! It will be connected – all can be arranged without any adjustment or fussy changes. It may not be visible on the image but once you are holding one to it, you will feel that the pintle is super heavy and buff and sturdy. This is definitely an ideal item to use when you want to tow heavy vehicles or machinery. If you are looking for a quality and durable pintle for your trailer, this would be the perfect one for your needs. Not all pintle hooks are coming with the promising feature and tough performance, but this one is different. The price tag is also affordable. On the overall performance, you can be sure that this pintle hook is durable. With the ability to handle 16,000 lbs of tongue weight, 14,000 lbs of ball rating, and also 3,000 lbs of vertical load, this one looks promising and reliable, right? The unit also has a grade 8 installation kit that will make everything easier. If you want to have a quality item without compromising price and also performance, this one should be included in your wish list. Another thing to like about the pintle is the great construction quality that will make sure that the bolt works just well without having to experience rust, damage, or dent. Most people say that the unit is solid and tough even after years of use. Even after years and years of rough beating, the unit doesn’t experience any damage – not even a rust or corrosion. It is safe to say that this pintle comes with good construction and also nice corrosion resistant feature. 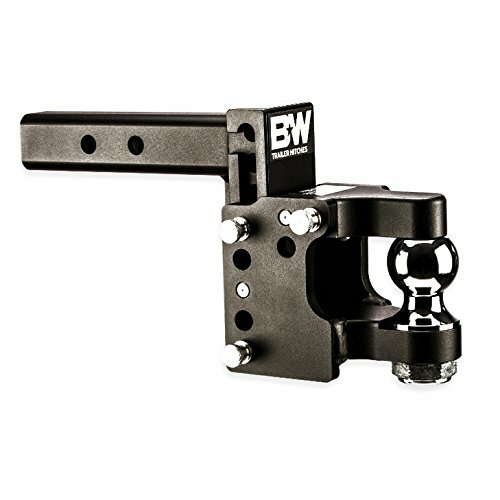 This pintle hitch from B&W may seem like a small unit but don’t let the image deceive you. If you see the real thing, it isn’t as small as you think – although it isn’t as big as the other units. It is almost a perfect device, getting 5 stars from 5 star-rate system. You can imagine how perfect and ideal this unit is – considering the performance and overall unit. It is no wonder if the price is the highest when compared to the other products in this review. Basically, this pintle provides 4.5 inches of rising and 8.5 inches of drop so it is flexible and convenient, especially for the heavy-duty use. This mount also provides a 2-inch ball for the overall construction. The 2-inch receiver will make sure that you have a tough and solid construction and structure, providing easy setup. This unit is made from high-quality material with zinc phosphate base and black powder coating for durable operation. Most users who have purchased the unit claim that the pintle has a nice combination of solid weight and easy flexibility. The unit is heavy and sturdy enough for the use – it will make sure that the pintle does the work well for towing. And yet it is light and flexible enough for adjustment. No need to break a sweat or fight with the pintle when you want to use it or make some changes. With a total weight of 31 pounds, this is definitely a quality unit that you want to have for your own use and needs. Based on the function, such a unit can be used for many applications and use. Transportation is just one of them – so you can be sure that by choosing the reliable and quality unit, you can be sure about the safety and also the security of the towing unit. The pintle comes in various designs and forms. Some units are coming with a pairing mechanism while some are coming in one unit structure. It depends on the users’ preference, really, whether they like the single unit or the separated constructions. The unit may look simple and small but such a seemingly small device holds the overall safety and security of the vehicle and the towing equipment (or vehicle). There are a lot of options and picks when it comes to the right unit. You have the options to choose the flexible one for your needs. You also need to choose the one fitting your requirements and also needs. With such a flexible option, you have the freedom to choose any unit that you like. Just like other products or goods, there are some positive effects to be expected as well as some negative problems. There are some positive outcomes to enjoy from using the pintle, after all. The unit has different unit arrangements and constructions. Whether you want to go with the two matching units or the single one device, you can be sure that such a unit should be able to help you with your towing requirements. The pintle is able to tag everything – from a classic trailer to heavier tractor. As long as you are able to choose the right device, you won’t have to worry about a thing. Be sure that the features and also specifications included in the device should enable you to tag your extra vehicle easily and without worry. The high-quality pintle comes with the right weight. In fact, if you are looking for a high-quality unit, you should be looking for the heavy one. In fact, if you read some of the positive reviews, you will see that the premium pintle has the combination of heavy unit and light (and simple) operation. The latching operation and the locking mechanism are very nice and solid. You want to choose the products from reliable brands and names if you want to have a long-lasting unit that isn’t easily damaged or broken. Most of the brands and the manufacturers have good customer service and support. They support product return and easy refund without a fuss. The solid construction of the pintle makes the users have a restful mind because they don’t have to constantly be worried about the vehicles they are towing. Some of the units are pretty heavy and even beefy. This may not be a problem for the majority of users. However, some users may have problems with the weight and thick design. But then again, such a thing depends on the users. Some units may need a little adjustment and changes. It may take extra preparation and efforts but it won’t make you break an excessive sweat over it. Not all units are made according to the standard sizing and dimension. In some cases, the users have to return the units because their trailer’s dimension and construction are not based on the standard sizing. But they are actually pretty satisfied with the entire construction and make. You want to consider your budgets. There are different units with different price ranges. Naturally, the higher the quality, the more expensive it will be. For the ones with long-lasting use, you may have to spend extra but it will be worth the spending. If you choose the cheaper one, you may end up spending more because you will have to do a repeated purchase. You want to browse your options for different types of pintle. There are different variants and styles out there – and they are designed for different usages and purposes. You want to make sure that you choose the right unit. Some are coming with ball mechanism while some are coming with the latch system. Some are coming as a pair while some are coming as a single entity. Check the quality of the product as well as the manufacturer’s service. You may want to choose the ones having an easy refund and also return policy. Who knows? Maybe your trailer (or other vehicles of yours) don’t come with the standard dimension or size. In the event it happens, you can always return the one you have bought and then got the right one. Don’t rush things. Always manage the purchase carefully and don’t be hasty about the purchase. Use the gauge to check any wear sign on the hook portion. If the wear has exceeded 1/8 inches, you should replace the hook. In the event that you can’t find the available gauge, contact the manufacturer. Search for any sign of damage – such as cracks, nicks, dent, deformation, or gouges. Any kind of deformity can lead affect the safe use of the hook. In the event that you spot such a sign, replace it. Don’t forget to check the mounting fasteners – it is for torque reasoning. You should also check the mounting surface for any sign of damage too. If you find any metal fatigue signs or cracks, you want to change it as fast as you can. Check and clean the latch as well as the air cushion technology for proper running and operation. When you lubricate the latch pivots, make sure to use the oil light lubricant. You also want to remove any excess oil that may attract dirt and sand. Maintain a clean practice, and you should be good to go. You don’t want to lubricate or grease the pintle hook’s horn. It may attract dirt and sand. When it happens, it will turn into an abrasive mechanism that will speed up the drawbar and horn’s wear. In the end, the unit can be quite beneficial if you have a trailer or other heavy vehicles that you need to tow. If towing is one of the most common (and often) things to do, then you need to consider choosing the high-quality products. After all, you want the unit that isn’t only functional and handy but also long-lasting and sturdy, right? Those 5 products can be your options. Be sure to do your own thorough research before making the purchase. Only by doing so, you can be sure that you can have a high-quality pintle hook that fits your requirements.